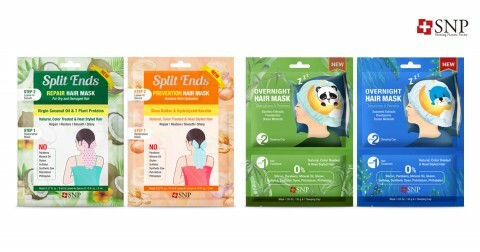 SEOUL, SOUTH KOREA--(Korea Newswire) August 16, 2018 -- On August 1st, SNP Cosmetics by SD Biotechnologies Co., Ltd. (CEO Park Sul-Woong) announced the launch of 4 types of hair mask at Walmart in the U.S.
SNP hair masks have been introduced at 2,500 Walmart stores, the world's largest retail corporation. The lineup includes 2 types of Split Ends Hair Mask and 2 types of Overnight Hair Mask. These 4 hair masks are free of chemical components that may damage hair. Split Ends Hair Mask is available in two versions to help prevent hair damage or to repair damaged split ends. On top of its practical design, the hair treatment is applied inside the hair cap to easily and quickly provide nutrition without directly using hands. Split Ends Prevention Hair Mask improves hair conditions of damaged hair from coloring and perming, while Split Ends Repair Hair Mask provides nutrition to damaged hair. Both masks help create voluminous and shiny hair in a short period of time. Customers can easily nourish damaged split ends with STEP 1 Split Ends Hair Mask and finish up with STEP 2 Serum for coating and styling. The overnight line comes in 2 types of self-intensive care with the same effects of a hair salon treatment. This lineup features panda and otter characters from the SNP hero product “Animal Mask” on the hair cap to add more enjoyment. Overnight Hair Mask - Nourishes & Renews is to restore smoothness to frizzy and dry hair. In addition, Overnight Hair Mask- Strengthens & Restores, effective for saggy hair from repeated styling, nourishes and provides intensive shine.